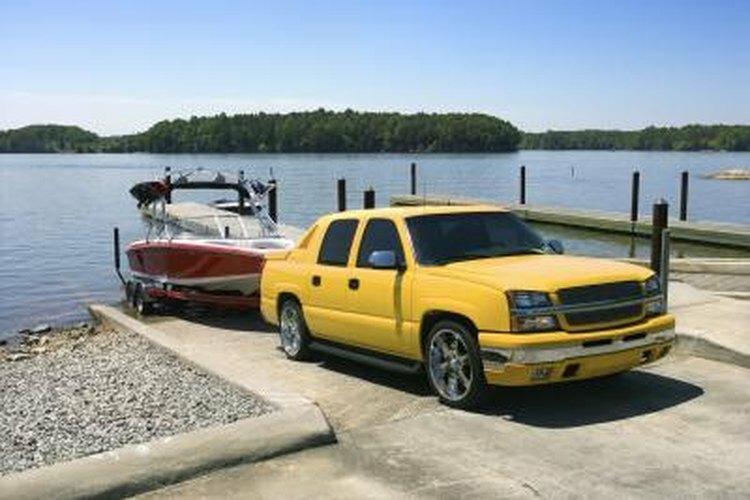 Many pleasure boaters prefer the ease and convenience of a boat trailer that tilts. The rear of the trailer frame is hinged, allowing it to pivot up or down during launching or retrieval. Tilting trailers are particularly useful when launching a boat in a shallow body of water or if the boat is lightweight, such as an aluminum-hulled runabout or small trailerable sailboat. Once you have arrived at the marina or launching site, getting your boat in the water is fairly simple. Back your vehicle and trailer to the top of the launch ramp and pause. Ask an assistant to attach two lines to the bow cleat/eye and the stern cleat/eye respectively. If your boat is equipped with an outboard, check to ensure that the motor shaft is tilted up. If the launch area is otherwise unoccupied, put the vehicle in park, apply the emergency brake, and load any gear into the boat. Resume backing down the launch ramp. When the trailer tires reach the water's edge, pause again. Ask your helper to remove the safety straps securing the boat to the trailer. Set them aside. Instruct your helper to release the latch pin on the trailer; this will allow the rear of the trailer to pivot upward. Then ask the helper to remove the hook attached to the winching cable and trailer winch from the bow eye. The bow eye is near the waterline. At this point, the boat will sit loosely on the trailer. Resume backing the trailer slowly into the water. Your helper should be walking alongside on the launching dock while holding both the bow and stern lines. Once the stern of the vessel begins to float on the surface, instruct the helper to begin slowly pulling the boat off of the trailer. The hinged section of the trailer will begin tilting upward at this point, and with the helper's assistance, the boat should begin sliding off the trailer on its own. Instruct the helper to continue pulling on the bow and stern lines until the vessel floats free. He should begin "walking" the vessel back to where the water is deeper. Pull forward with your vehicle until the trailer wheels are back out of the water. Place the vehicle in park and apply the emergency brake. Dismount from the vehicle, and secure the hinged section of the empty trailer with the latching pin. Retrieve the tie-down straps and place them in your vehicle. Get back into your vehicle and tow the trailer to the designated parking area. Reattach the two lines to the bow and stern. Do this as soon as you return to the launching area. While your helper secures the vessel at the dock, back your vehicle and trailer onto the launching ramp. Stop, place the vehicle in park and apply the emergency brake. Dismount from the vehicle and pull the latching pin on the trailer, allowing the rear end to pivot. Release the winch and manually pull out the cable as far as it will reach. Remove the tie-down straps from the vehicle and place them nearby. Double-check that you have raised your outboard motor shaft. Back the trailer slightly into the water. Do not let the water level extend past the tires. Place the vehicle in park and apply the emergency brake. Ask your helper to bring the boat forward and move it onto the end of the trailer. At this point, the pivoting portion will begin to rise. Use the line attached to the bow to pull the boat forward until you can attach the winch cable to the lower bow eye. Crank in the cable. As the boat begins to move forward onto the trailer, the tilted portion will gradually lower itself back down. With the boat secured, release the brake and pull the trailer slightly forward. Pause and ask the helper to secure the latching pin, which will lock the tilt mechanism. Attach the tie-down straps and tighten them securely. Drive to the parking area, unload any loose gear and stow it in your vehicle.